It’s been a tough month or so for the metal band Slipknot as drummer Chris Fehn was removed from the band, and singer Corey Taylor explained how Chris falsely accused the band of taking money from him. Although the band and it’s other members shook off the negative accusations, there was some good news that came along. The RIAA (Recording Industry Association of America) on March 18th (which happens to be the same exact day that Chris was let go by the band) released the news that 3 of the band’s songs were now regarded as Platinum singles. The three songs are ‘Snuff’, ‘Wait To Bleed’ and ‘Before I Forget’. If you want to bang your head a bit, the music video for ‘Wait and Bleed’ can be found below. The oldest of the three songs ‘Wait and Bleed’ was released way back in 1999. The second oldest is ‘Before I Forget’ and that was released back in 2005. The final song ‘Snuff’ was released 10 years ago back in 2009. When a song goes Platinum, it means that it sold (including streamed and downloaded) over 1 million times. If you were unaware, Slipknot will be on tour later this year in North America on their trek which is named Knotfest Roadshow, and will also feature bands Volbeat, Behemoth and Gojira. These shows will be something not to miss if you’re a fan. This is very well deserved. 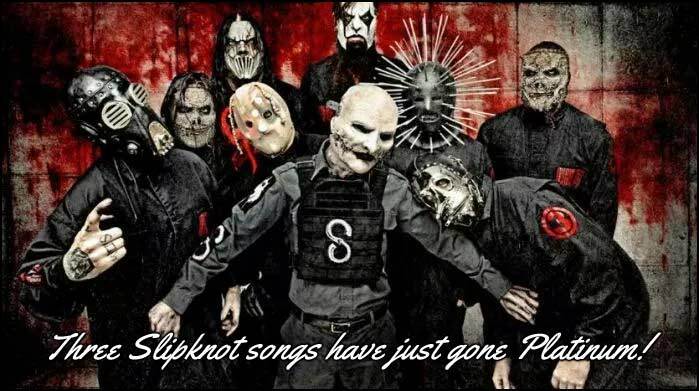 Three Slipknot songs have just gone Platinum! ‘Snuff’, ‘Wait To Bleed’ and ‘Before I Forget’.